When I was pregnant with my first kid, I wondered what the worst part about raising a child would be as a mother. For some silly reason (probably because I didn’t know any better) I thought that perhaps cleaning up vomit or changing diapers or cleaning up all the messes would be the worst thing ever. After all, those things were gross. Wouldn’t that be the worst thing to deal with? No, the worst part is not about cleaning up after my children. Hardly! For me? The worst thing, as a mother, is to watch my child suffer. And to know that, as a mother, there is absolutely nothing I can do to help ease the suffering. 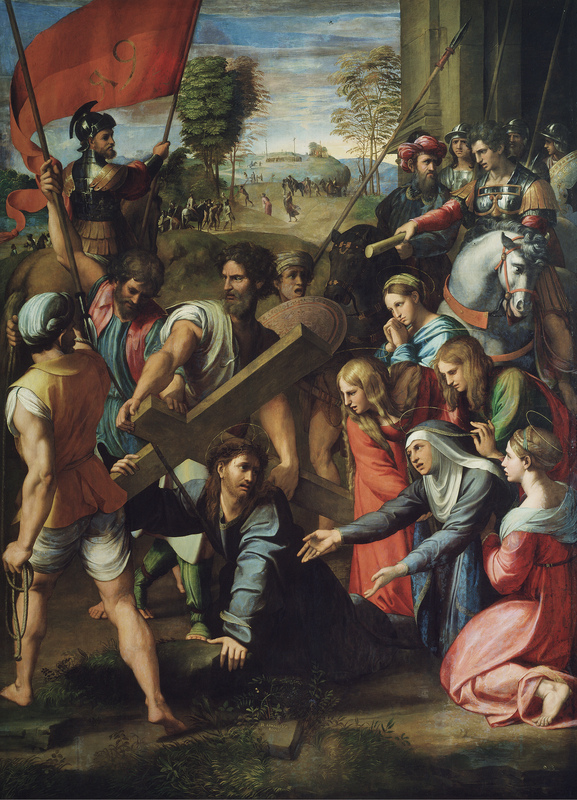 Christ Falling on the Way to Calvary, by Raphael, c. 1514-16. Museo del Prado, Madrid, Spain. But He can’t. He has to carry that cross and there’s nothing that she can possibly do to save Him from that grisly fate. All she can do is watch helplessly as He suffers and just be there for Him while, far off in the background, Calvary waits. What person in this picture captures your eye? What person do you identify with most in this picture? Have you ever had to watch suffer without being able to do anything? How did that make you feel? You suffered because of me. May I submit myself to You and follow You. This picture is featured in my new book, The Sorrowful Mysteries, which pairs artwork of the Sorrowful Mysteries with each prayer of the Rosary. Take a peek at it here!